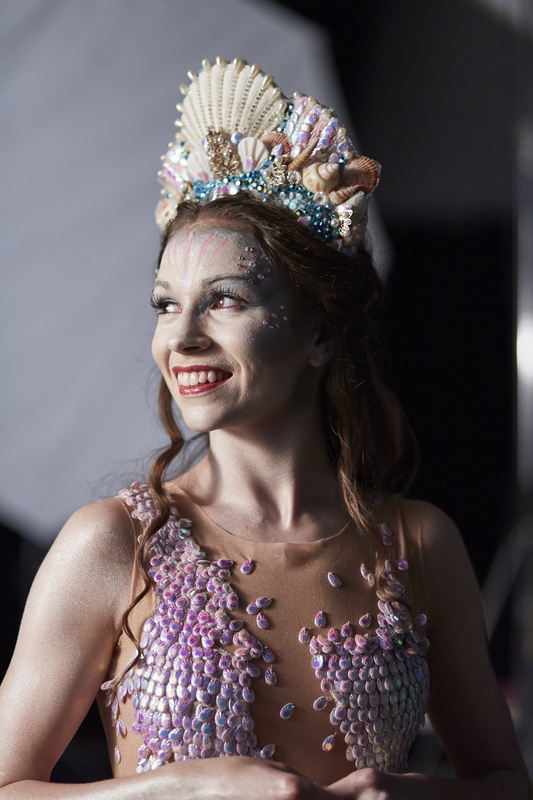 Northern Ballet soloist Abigail Prudames is taking dance audiences on an amazing aquatic adventure in the company’s newest production, The Little Mermaid. Dancer Abigail Prudames is getting so used to decorating her face with iridescent make-up, flaunting a headdress adorned with seashells and slipping on a shimmering fish tail that being a mermaid is her new normal. The 25-year-old soloist was cherry-picked by Northern Ballet’s artistic director, David Nixon, last year to originate the principal role of Marilla the mermaid for his balletic rendering of Hans Christian Andersen’s classic fairy-tale, The Little Mermaid. She started discovering and developing the mystical creature’s personality and mannerisms in earnest from May 2017. Just four months later, on 21st September 2017, the production had its world premiere in Southampton. Abigail, who is from Harrogate in North Yorkshire, trained at the Royal Ballet School, White Lodge and Elmhurst School for Dance. 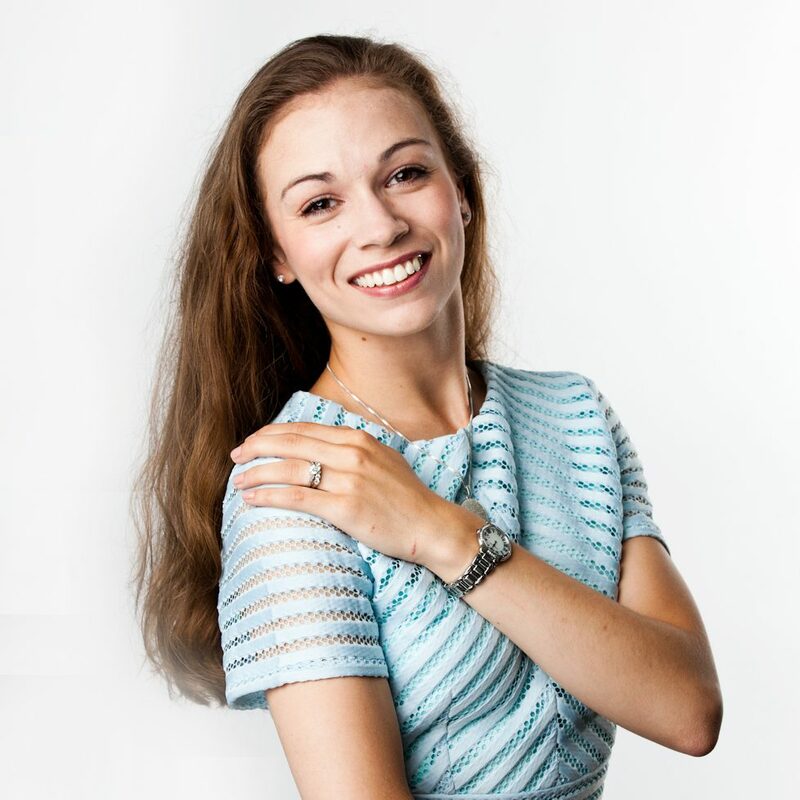 She joined Northern Ballet in 2011 so has enjoyed dancing many characters but The Little Mermaid’s Marilla is the very first title role that has been created on her. We squeezed in an interview between Abigail’s rehearsals for Northern Ballet’s concurrent touring production (a revival of Cathy Marston’s Jane Eyre), the company’s daily class and performances of The Little Mermaid in Edinburgh. Read on for her thoughts on the creative process, dancing as a mermaid and why this immersive new ballet is making such a splash with audience members of all ages! Last year, 2017, was a momentous one for Northern Ballet as the company premiered three new ballets – Casanova, The Boy in the Striped Pyjamas and The Little Mermaid – in just twelve months. The dancers performed Kenneth Tindall’s Casanova when they made their annual visit to Milton Keynes Theatre in April 2017. The brilliant thing about the company is that we get so many opportunities to dance in different casts. When we were last in Milton Keynes with Casanova, I was one of the Savorgnan sisters, a guest at the masquerade ball and a courtesan in one cast. I also got to dance as Casanova’s main love interest, Bellino, in another cast. The lavish parties of Casanova are worlds away from the underwater adventures of The Little Mermaid, so it is exciting to once again be bringing something different to Milton Keynes. Abigail, your training will have prepared you for the routine of drilling technique and learning all that choreography but are there any gems of wisdom that have stayed with you? What is the best advice you have received from a dance teacher and would like to share with aspiring dancers? Wow, that is difficult to answer! I had so much advice and inspiration during my training. Even now, I am still receiving advice in my daily life as a professional dancer with Northern Ballet. I have always put faith in having the intention of going out onto the stage and trying to deliver my best. That’s really all you can do. You need to trust in yourself that you’ve done all you can. Trust in your preparation and hard work and believe that you can do it! Marilla is a role that has been created on you. How did this opportunity arise and what does it mean to you? Marilla is the first title role I have ever been part of creating so she is very special to me. Really, it was more of a process than a big reveal. I was involved in costume design but there was never a big announcement. Of course, then the casting goes up and it is very nice to see it in writing! Long before we started in the studio, the composer Sally Beamish, set designer Kimie Nakano and our wardrobe department were hard at work with David creating the world of The Little Mermaid. Importantly, for me, it has been all about figuring out who exactly Marilla is. Go on then: who is she? Marilla is not a human being or an animal. She is a fantasy creature. So, she is different. Even once she has her legs, she is always slightly different. Moving underwater is entirely natural for her, it’s all she knows. Of course, it’s not natural for me. There are two sides of her that I have to portray but there is a continuous flow to who or what she is. She ends up on the surface in this world she can’t communicate in. That quality of not quite belonging needs to be clear to the audience. It has taken a lot to figure her out. I still struggle now to put into words exactly who she is. What can you tell us about Marilla’s story in The Little Mermaid? Marilla is the youngest of three mermaid sisters and is quite immature and childlike. She has no life experience apart from being in the water with her best friend, a seahorse called Dillion. Marilla dreams of swimming to the surface and exploring the human world. Her older sisters often swim to the surface, but they refuse to take her with them. One day they return with some treasure, including a locket. Inside the locket is a picture of a young human man, Prince Adair. When she sees his picture, Marilla falls in love with Prince Adair. She then rescues him from a shipwreck during a storm and is convinced they are meant to be together. Their relationship has already started for her, even though she has not got legs and cannot communicate with him. It seems natural to her that she should agree to sacrifice her singing voice and her life in the ocean for legs so that she can be with him. It’s a love story but it is also about Marilla’s growth as an individual. It reveals her realisation that she is different and shows her naive trust in giving up a huge part of who she is – what she knows and what makes her happy – for what she believes to be true love. What did the process of creating Marilla involve? I read the book by Hans Christian Andersen but the wonderful thing about such a process is that Marilla is still evolving now. Her whole existence is always open to interpretation. There are four of us doing Marilla so when audiences watch different casts they will get slightly different interpretations. That is the beauty of having so many different casts producing live performances; it can still be quite individual, even though we are doing the same steps to the same music. It really is so special, being able to bring something of yourself to a role. From the very first day in the studio, we questioned how Marilla would react. How she would behave. How she would move. We did not really set aside a lengthy portion of time for character development, it was just constant investigation. I think this approach has made it feel like we have truly created this show ourselves, in collaboration. A key question surrounding the creation of this ballet must have been: how do you dance as a mermaid? To be Marilla, I am constantly moving because nothing is ever still in the water. Imagine being a piece of seaweed – it moves because the water moves it. Even if I stand still on the stage I must keep moving, just like when you are in a swimming pool and the water covers and moves you. Half of the ballet is underwater, so it is all about fluid movement and dancing with the flowing mermaid tail. Then, when Marilla is in the human world, the humans have sharper movement but I’m still fluid. Which is your favourite part of The Little Mermaid to dance? It sounds cruel, but I most enjoy dancing the parts that hurt her! The pain solos. From what I have heard from audiences, these moments come across well. This feedback makes the tension and effort in my body worth it. So, it’s not a scene that I particularly enjoy, it’s her journey. She’s a constant throughout the ballet and the most painful moments help her grow. The ballet is not based on the Disney version of the underwater tale and there is no “happily ever after” ending for Marilla. What has the reaction from audiences been like? Often the best stories have some darkness to them but there is a lot of light and shade in this production and plenty for the whole family to enjoy. We have fish, jellyfish, sailors, mermaids in shimmering costumes, glamorous ladies in beautiful red dresses. There is a lot of colour, which makes the ballet attractive to children. The seahorse character, Dillion, is bright orange and fuchsia pink and a real favourite with the children. And Lyr, the Sea Lord, has fabulous make-up all over his body and proves popular with the boys who watch the production. I’d say there is something for everyone and it speaks to adults and children alike, they just have different perspectives on it. My little brother is eleven and he understood and appreciated the ending. And I spoke with an elderly lady who was in tears telling me how much my performance of Marilla’s pain had moved her and that she will never forget it. That is something I will never forget, the knowledge that I have been part of that lady’s life in that way. I think the kids find themselves in awe, while the adults become mesmerised by the pain and poignancy. And everyone admires the costumes! The tail was with us from the beginning. We had a prototype in the very first rehearsal, so it was believable from the start and so that we didn’t create any movement that then didn’t work. I was in the fittings when everything was being decided about how the mermaid tail was going to look. This meant I could add my thoughts when the designers asked questions like: how does it move; do you think it will it work; is it comfortable? It was more like a prop to start with. We had to learn to incorporate it into everything. It was tricky at first but towards the end it just became like second nature that I did have a tail! For the second act, Marilla’s costumes should still make you think of the water when you see her, even though she is on the land. They are shades of blue and green and they sparkle and glisten like water. They are very floaty, they move beautifully. Just like her movement, Marilla’s costumes contrast with the human outfits. These are very vibrant in colour, bright red. The sailors have big shirts like blouses and baggy trousers, almost kilts. I think a big part of the excitement of being involved in the creation of The Little Mermaid is that it’s really rewarding to see the final product when you know how it started. Even the journey that the costumes have been on! > Northern Ballet’s The Little Mermaid visits Milton Keynes Theatre from Tuesday 17th April 2018 until Saturday 21st April 2018. A version of this interview is featured on Total MK.